1) (co. Hereford, and London; granted 1685). Gu. two chevronels betw. three falcons ar. beaked, legged, and belled or. Crest—A falcon ar. beaked, legged, and belled or, holding in the mouth a buckle of the last. 2) (co. Somerset). Gu. three round buckles ar. 3) (co. Herts). Gu. a chev. betw. three falcons ar. 4) (London). Az. a chev. and fesse ar. in chief three annulets or. 5) (Lord Mayor of London, 1379 and 1393). Az. a chev. betw. three annulets or, over all on a fesse of the second as many martlets gu. 6) (Cranbrook Park, co. Essex; granted to Simeon Charles Hadley, Esq., Alderman and Sheriff of London). Gu. three chevronels or, betw. as many falcons belled ar. in the centre chief point a buckle, the tongue erect of the second. Crest—Upon a mount vert a falcon belled ar. supporting in the dexter claw a buckle, as in the arms, and holding in the beak three ears of wheat or. Motto—God is my help. 7) Ar. a pair of compasses, and in base an annulet sa. 8) Gu. on a chev. or, three crosses patonce of the first. 9) Gu. a chev. ar. betw. three plates, over all a fesse az. 10) Az. a chev. surmounted of a fesse betw. three annulets or. 11) (Reg. Ulster’s Office). Gu. three oval buckles ar. tongues fessways. 12) (Simeon Charles Hadley, Esq., of London). Gu. three chev. or, betw. as many falcons belled ar. in the centre chief point a buckle, the tongue erect of the second. Crest—Upon a mount vert a falcon belled ar. supporting in the dexter claw a buckle as in the arms, and holding in the beak three ears of wheat or. 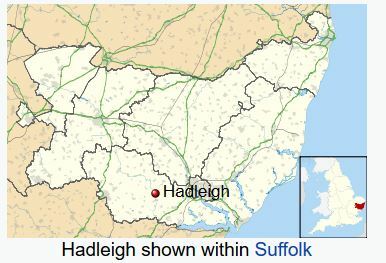 This Anglo-Saxon surname is a local name meaning “of Hadley” or “of Hadleigh”, which are parishes in counties Suffolk, Middlesex, and Essex. Another author claims there are also places with this name in Hertfordshire, Berkshire, and Staffordshire. In his book, Homes of Family Names, H.B. Guppy writes “The Hadleys derive their name from places in the adjacent counties of Staffordshire and Shropshire”. It comes from the word houdt (wood) and ley (field or place). Another source states it comes from the Old English first name Hadda (meaning hardy, strong, or brave, and the word leah (wood or clearing). One source states it means “forest clearing where the heather grows” and another one states it means “a wild heath where cattle graze”. The Domesday Book of 1086 AD, a survey of England and Wales ordered by William the Conqueror, records locales with the names Haethlege, Hatlege, and Hadlega. The Hadley arms were contained in the notebook of Sir Richard Carney, Ulster King of Arms, from 1683 to 1692 and were of the Hadley family of Somerset and Ireland. When the Quaker Hadley’s emigrated from Ireland to Pennsylvania, US in 1712 AD, both of the forms Hadley and Hadly were used by the family. Common spelling variants of this last name include Hadlee, Hadleigh, de Haddeleigh, and de Haddesley. The first person recorded with this last name was Matilda de Hadlegha in Pipe Rolls of Suffolk in 1194 AD. The name was recorded in 1327 as Haddeleye. The Hundred Rolls of 1273 AD, a census of Wales and England, known in Latin as Rotuli Hundredorum, documents two people bearing this surname: Robertus de Hadley in county Suffolk, Nicholas de Haddileg in county Salop, and John de Hadlee in London. A one Wardin de Hadlai was recorded in Yorkshire, Richard de Hadlege in 1311 in Cambridgeshire, and John Hadley in 1390 in Essex. The Somerset Hadley’s trace their ancestry to King Edward I.
Richard Hadley, birthdate unknown, married a woman named Phillipi and had a child names James. James (born in either Dublin or England) married Jane Rosewell and had a son named Simon. Simon was born in 1640 in Westmeath County, Ireland. He married Catherine Talbot and had five issue with her: Elizabeth, Jane, Soloman, John, and Simon II. Simon II was born in 1675 in the same county. He married Ruth Miller in 1697 and later Phebe Grubb in 1752. He had the following children: Joseph, Deborah, Joshua, Simon, Hannah, Ruth, Catherine, and Anne. He died in Southwood, Pennsylvania. Joshua was born in 1703. He married Mary Rowland in 1725 and later Patience Brown in 1735. He was the father of Ruth, Thomas, Sarah, Sarah, Simon, Mary, Jeremiah, Joshua, Joseph, Deborah, Hannah, and Catherine. Joshua was born in New Castle, Delaware in 1743. He had three wives (at different times): Lydia Beals, Ruth Lindley, and Jane Hinshaw. He left behind the following children prior to passing away in 1815: Sarah, Thomas, Simon, Joshua, William, John, Infant, Ruth, Mary, Jeremiah, Jonathan, Jacob, Joshua, Catherine, Joseph, Patience, and Jane. Thomas Hadley was born in 1763 in Chatham County, PA. He married Mary Newlin and had the following children before passing away in 1832 in Mooresville, IN: Hannah, Joshua, John, Eli, William, James, Mary, William, Ruth, and Dinah. John was born in 1788 in Randolph, NC. 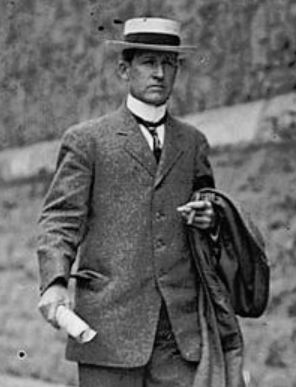 He married Hannah Barker and later Elinor Chamness. He had the following issue:Lydia, Ruth, Elizabeth, Mary, Dinah, William, Zilpha, Enos, Asenath, Samuel, Malinda, Mariom, Hannah, James, Sybil, Ann, and Martha. He died in 1856. His son Enos Hadley was born in 1828. The book “Genealogical Guide to the Early American Settlers” mentions two early settler with this surname: George Hadley of Ipswich in 1639 and George Hadley of Rowley in 1668, who may be the son of the preceding. Other settlers include Ambrose Hadley (Virginia 1701), John Hadley (Virginia 1703), and Martha Hadley (Maryland 1736). The family motto is “God is my help” (Latin Deo auxilium mihi est). Some Irish members of the family had the motto “Victorious fidelity in authority”. Famous people with this last name include: 1) Arthur Twining Hadley (1856-1930) who was an American economist, 2) Herbert S. Hadley (1872-1927) who was a Governor of Missouri, and 3) Tony Hadley (1960) who is a British pop singer.